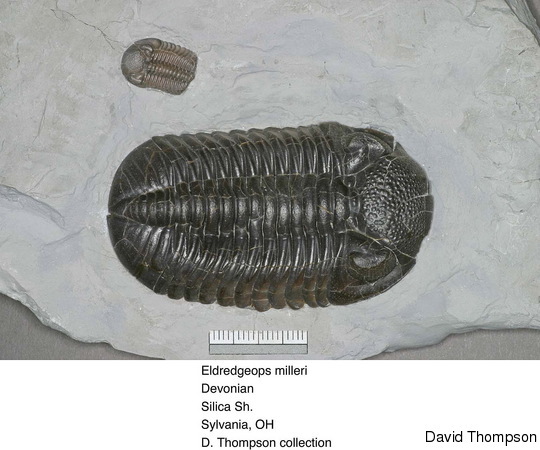 Submitter notes: This dual speciman shows a large adult & smaller trilobite. They are in the same layer & it would be nice to think of 'Mom & Baby' but the association may not be close at all. Clearly they were killed very quickly as they have not really started to enroll as this species often is found. 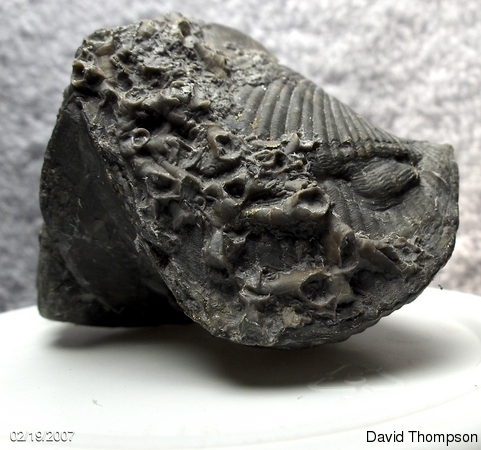 This was self collected in Sylvania but prepared by Scott Vergiels of our 'Friends' who has prepared most of the trilobites I have posted. Sorry I'm old fashioned & these are still 'Phacops' to me. 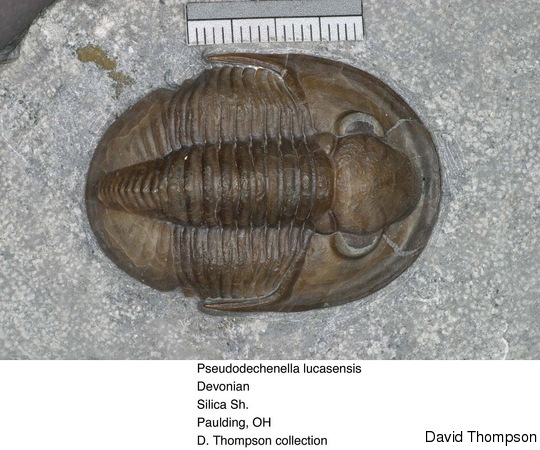 Submitter notes: This is both a large & pristine example of this Taxon collected from Paulding Co. in Ohio. The speciman when collected had only a top of a few axial rings showing out of the shale. Submitter notes: This speciman is unusual due to the preservation & preparation from the underside which shows the Hypostome or mouth area. The thin shell is translucent in this view. 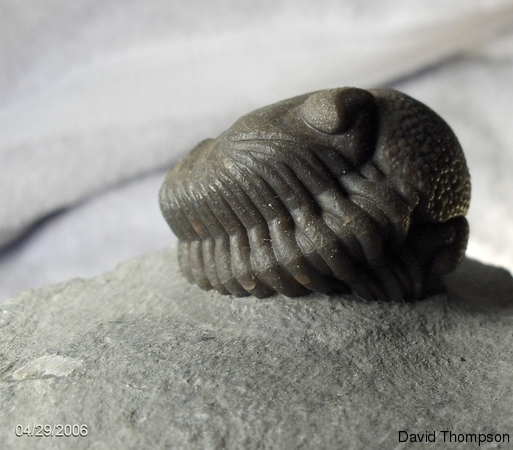 Crassi's have 84 eye facets as opposed to 104 in the milleri species of this Devonian trilobite. 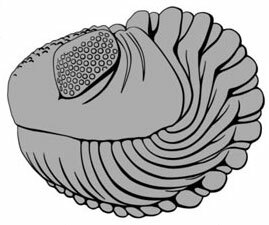 Submitter notes: This third view of this Phacops continues to show the hypostome (mouth cover) and shows the 'pits' along the lip of this taxon. 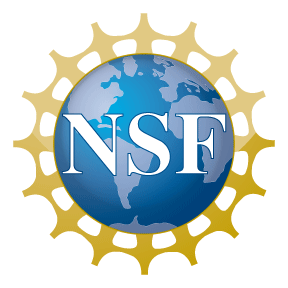 The exact purpose of these has been debated as locking points for the pygidium when the bug is enrolled or it may be something completely unrelated. Post your ideas! 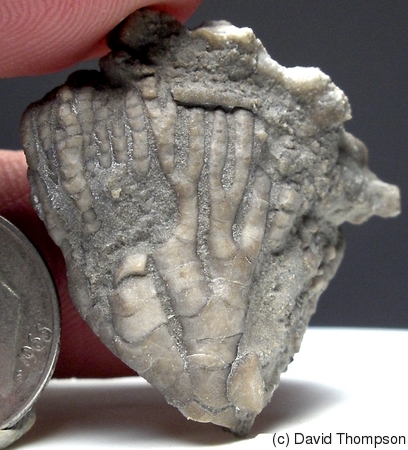 Submitter notes: This Silica Crinoid, Gilbertsocrinus ohioensis, is beautifully displayed as a whole speciman elsewhere on this site. 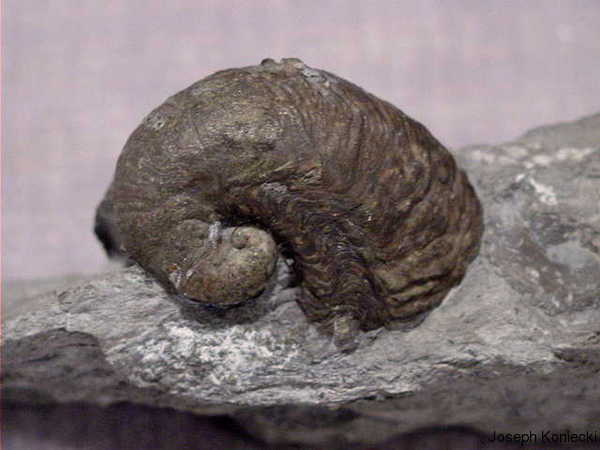 This example is a side view of the caylx with stem and showing the spine at the bottom in place while a small Platyceras is attached at the top right. 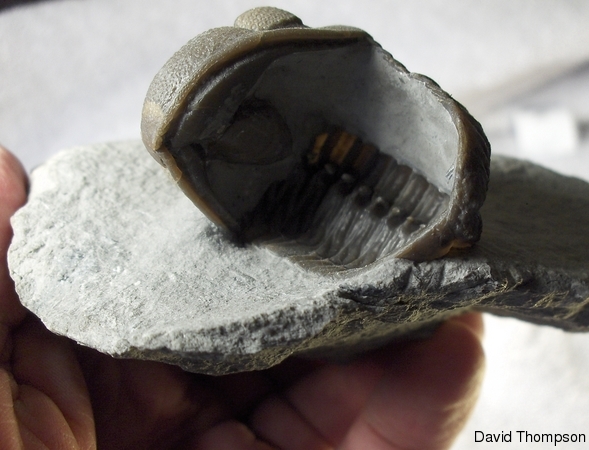 Given the large spines on this crinoid, the Platyceras had to get on top some way other then crawling up the sides! Submitter notes: This view of the previous speciman shows the Platyceras more completely and another large spine at the bottom of the caylx. 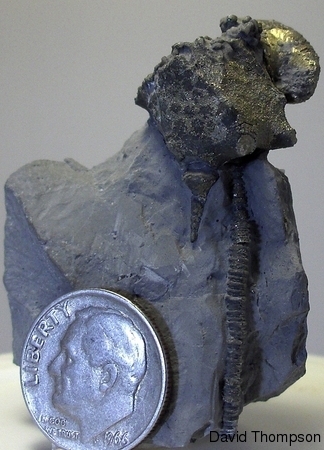 The Silica preservation has more pyrite in the fossils often making them rather 'brassy' looking. 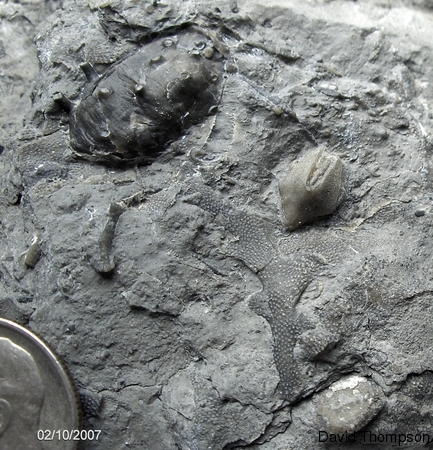 Submitter notes: The Phyllocarids were large shrimp-like crustaceans with four species identified in the Silica Formation. These mandibles are often found with nothing else to identify the species. This is a complete set from one side of the animal. 10 cent piece for scale. 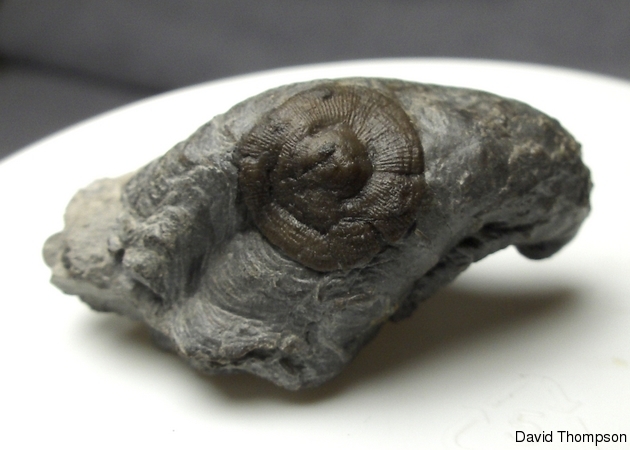 Submitter notes: This is a Platyceras with the bryozoan, Botryllopora socialis, encrusting it. Elsewhere on this site John Topor shows another example of this unique 'star-shaped' bryozoan on matrix. Here it is happily living on a snail. A 10 cent piece is for scale. 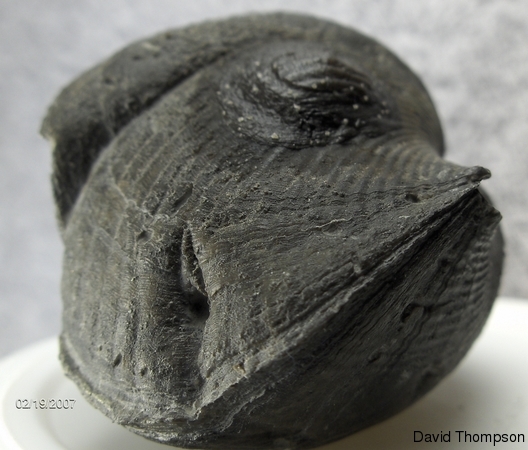 Submitter notes: This Platyceras has an inarticulate Brachiopod, Philhedra crenistriata, living on it. 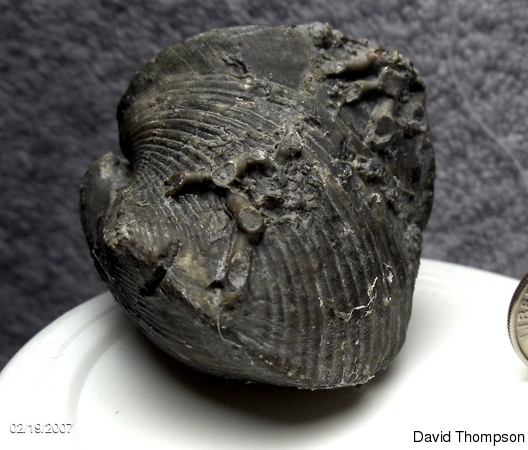 In the Devonian seas, if you were solid, someone started living on you quickly. 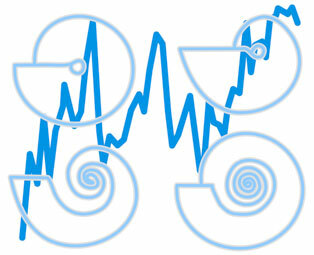 This inarticulate has clear lines radiating from the center as a diagnostic feature and this shows clearly in this picture. 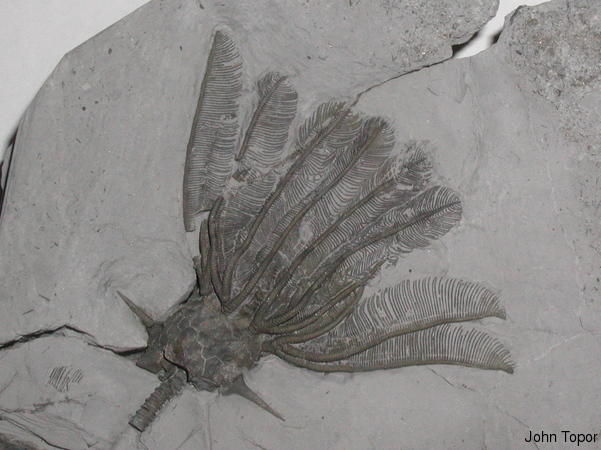 Submitter notes: This is the right side of the same Paraspirifer bownockeri showing additional epifauna. Again the top is heavily infested with Aulopora tabulate coral but also there is a scared area from an early injury & this has made a snug spot for the inarticulate brachiopod, Petrocrania hamiltoniae, to take up residence. 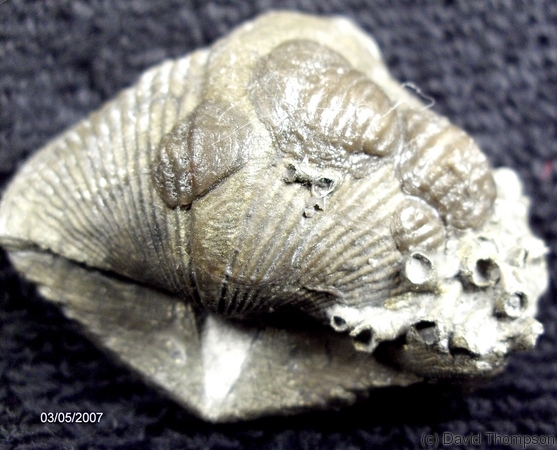 Submitter notes: This is a different Paraspirifer bownockeri then the previous two views of the same brachiopod. This example shows the scar and living tube of Cornulites worm that has been on this Paraspirifer a long time given the depth of the scar created. 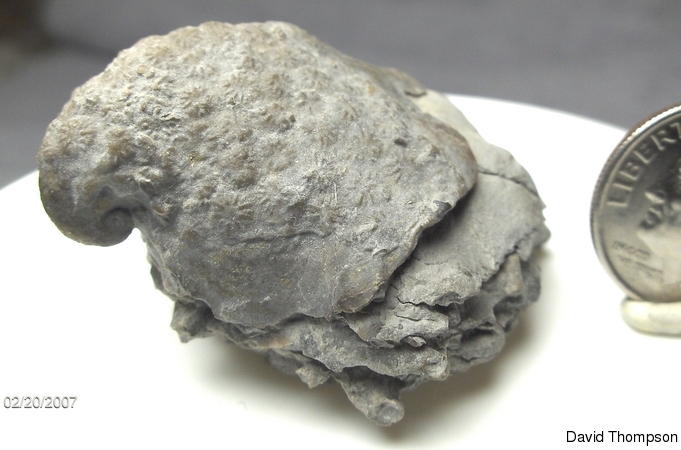 On the top is another large inarticulate brachiopod, Petrocrania hamiltoniae. Submitter notes: This image compares the structure & size of Microcyclus thedfordensis with the small corals, Pleurodictyum (Procteria) cornu from the Michigan Silica formation. 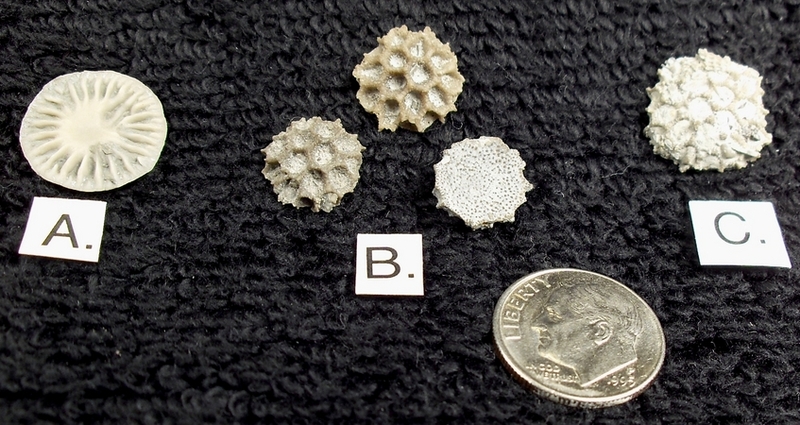 A. is an example of the Microcyclus from the Thedford area of Ontario, B. shows three examples of the Pleurodictyum, two with the upper multi-coralite side showing & the third showing the under side of another example. Unlike the Microcyclus, the Pleurodictyum does not start by attaching to anything. 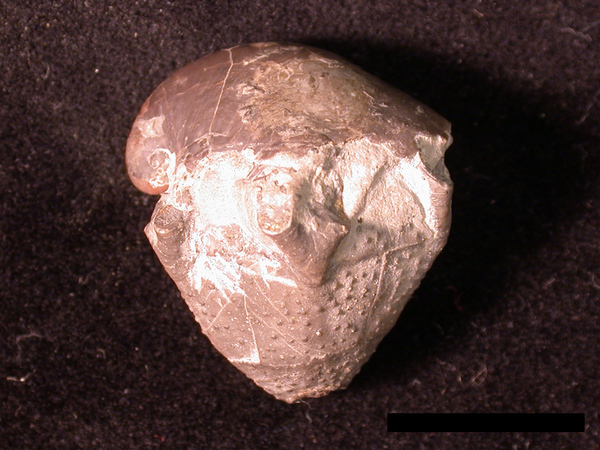 C. is a slightly larger example of the Pleurodictyum from the Bell Shale in Rockport, MI. 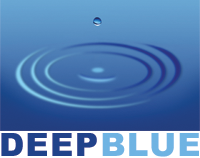 Mike Toper has other examples on this site of Microcyclus. The U.S. ten cent piece is for scale. 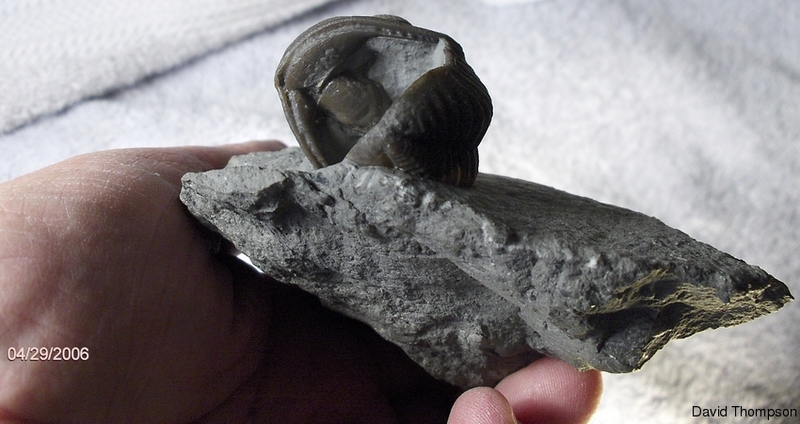 Submitter notes: This is another species of 'spirifer' Brachiopod from the Silica formation. 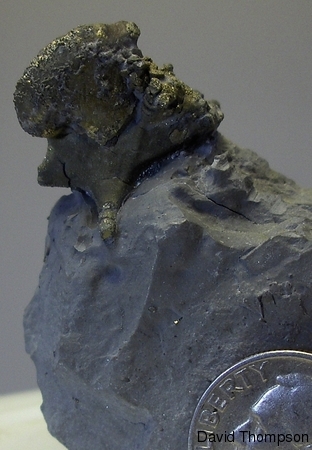 This top view shows 4 inarticulate brachiopods, Petrocrania hamiltoniae, clustered on the top valve on one side only along with Aulopora corals. There is an additional inarticulate on the underside also which may indicate that this end was above the substrate and allowing the epifauna to live in this area. 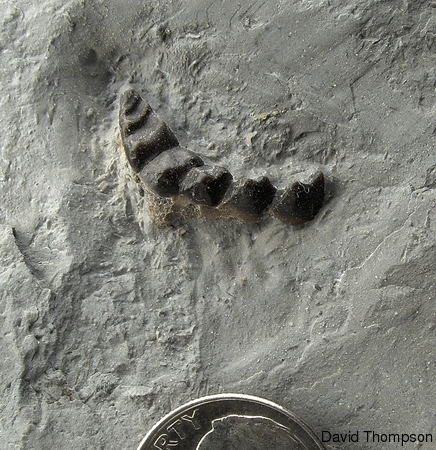 Submitter notes: This Flexible crinoid from the Sylvania Silica formation is a good size for this species. These are not common. Ten Cent piece & fingers are for scale.